For the past few months, near-daily reports of new cases and deaths from a new type of coronavirus called MERS raised fears that another pandemic, similar to SARS (severe acute respiratory syndrome), was looming. That's not the case, according to new research from France published Thursday in the British medical journal The Lancet. A mathematical analysis of the known cases suggests that "MERS-CoV does not yet have pandemic potential," even when looking at the worst-case scenario, according to researchers. They looked at the "reproduction value" or R-value, which is a calculation of the number of infections caused by one infected person. If the R-value is bigger than 1, the number of infections will grow exponentially. For example, if 10 people have MERS and the R-value is two, then those 10 people would infect 20 people, and they would then infect 40 people etc., explains Chris Bauch, a professor of applied mathematics at the University of Waterloo in Ontario, Canada, and one of the authors of an editorial accompanying the research. However, if the R-value is less than 1 - "if for each infected person, there is less than one more infected person on average, then that means the virus has to die out," he explains. So if you have 10 people initially infected and the R-value is .5, for example, then those 10 people would only infect five more people and they would only infect two to three people, who then would infect less than one person and the virus dies out. According to this new study, looking at the current MERS strain - in the worst-case scenario - MERS only has an R-value of .69, less than one, meaning it hasn't reached pandemic potential yet. Reports of new cases of MERS have slowed a bit. It's been more than a week since the World Health Organization reported the most recent new cases of MERS. Worldwide, there have been 79 laboratory-confirmed cases of MERS infections, including 42 deaths, according to the latest information from the WHO. 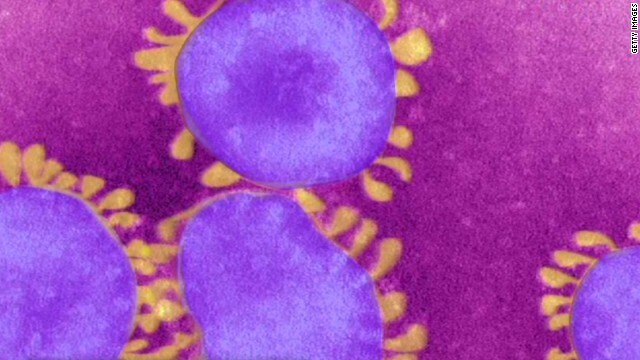 Health officials "are testing loads of cases and not getting very many positives," says WHO spokesman Gregory Hartl, another sign the virus isn't spreading rapidly at the moment. However, "we are not out of the woods yet," says Bauch. "This virus could evolve." Viruses are known to mutate, and when that happens, they can spread more easily. Bauch adds that any kind of seasonal change like colder temperatures forcing people to spend more time indoors around other people - or the upcoming Hajj in October, where millions of Muslim pilgrims will travel to Mecca, Saudi Arabia, and then return home - could change these calculations. The WHO expects to see more cases of human-to-human transmission during the Hajj and among travelers returning to their home countries, says Hartl. There are also still other unknowns surrounding this virus. "We don't know how it's being spread," says Capt. David Swerdlow of the U.S. Public Health Service, an infectious disease expert at the Centers for Disease Control and Prevention. He also says that "right now we may only be hearing about the most severe cases." What's not known is how many other people may have been infected and show no signs of illness or only have mild disease and therefore don't go to the doctor and get tested. "The true infection rate will be really important to assess the real risk," say Swerdlow, who heads the MERS response team in the CDC's Emergency Operations Center. MERS cases originated in Jordan, Qatar, Saudi Arabia and the United Arab Emirates. France, Germany, Tunisia and the United Kingdom have also reported confirmed cases of MERS, but all of these patients contracted the disease in Middle East before being diagnosed. Limited human-to-human transmission of the disease has also occurred in France, Italy, Tunisia and the UK. Bottom line, says Bauch, "we need to keep updating the R-value." The study authors conclude their analysis confirms the importance of enhanced surveillance of MERS-CoV infection and an active search for its animal host. Health officials say this is key to preventing a MERS pandemic. Update: On Friday, WHO gave its latest assessment of the MERS outbreak. Dr. Keiji Fukuda, WHO's assistant director-general for health security and environment, reiterated that "there's a lot we do not know" about this virus. He noted that over the past three months, the number of cases has remained steady: 19 cases in April, 21 cases in May and 22 cases in June. Fukuda also said that it's very hard to make any predictions; the virus could fade away, stay consistent at around 20 cases per month or become much more widespread. Given all the uncertainties surrounding MERS, Fukuda announced that the WHO was "proactively" convening an emergency committee next week. This will be only the second emergency committee ever convened by WHO; the first was assembled in 2009 during the H1N1 pandemic. The committee will be a group of outside experts from all over the world who will provide technical advice to the WHO director-general in the context of a “public health emergency of international concern." The group will include infectious disease experts, virologists, epidimiologists and other public health experts who will review all that is known about MERS. The experts will have direct access to officials in countries that have already dealt with MERS, without having to go through the WHO. The committee will make recommendations to the WHO on how to proceed and could eventually decide that the current MERS-CoV outbreaks constitute a public health emergency. Or if your caps lock key worked. Maybe obama will bring it back from his Africa trip. Then we can worry. It isn't moving fast enough from person to person, they can still catch this thing before the zombies dig their way up! Surveillance is not enough. If we want to truly get at one of the root causes of the evolution and emergence of new pathogens like MERS, we need to address how we treat animals. SARS was traced back to the wildlife trade. For more, check out the book, Animals and Public Health. Why Treating Animals Better is Critical to Human Welfare. It shows how so many of our major heath issues are related to animal treatment. So a non-story is now admitted to be a non-story. My fifty posts saying how lame the scare tactics were now become common knowledge? From apost months age... Whenever there is a new type of flu (or cold) every one freaks out and calls it deadly. The truth is that the regular flu and common cold can be deadly as well and with a new type of bug, only the very sick go to the hospital and get diagnosed with the new type. That makes the mortality rate seem much higher then it really is as people who have no symptoms or mild symptoms will not go to the hospital and therefore never get diagnosed with the new type of flu. If 100,000 people get the new type of flu (or cold) and only ten get sick enough to go to the hospital and 5 of them die, then the death rate would seem to be 50%. No one knows about the 99,990 that got it and were OK as they never went to the hospital and never got tested for the new type of bug. Probably the death rate from this type of infection is the same or less then the older types of flu and cold viruses. Even the huge flu of 1918 would probably not be nearly as bad if it struck today as I am sure that many who died back then died from secondary pneumococcal infections that we can easily treat today as many of them respond well to antibiotics.